Are you a student looking to learn, grow && network? Then, by all means, read more, because the biggest #Perl Conference in Europe is coming to town at the end of August 2016. It’s the first ever Transylvanian edition of YAPC::Europe && we’re extremely proud to host such an important conference in Cluj-Napoca. The giveaway will run from July 1st — 15th, and I’ll draw a winner on the 16th. All you have to do is follow 3 simple steps: - Be a student - Fill out the form below - Make sure you’ve got all your details right, we’ll be announcing winners by email. 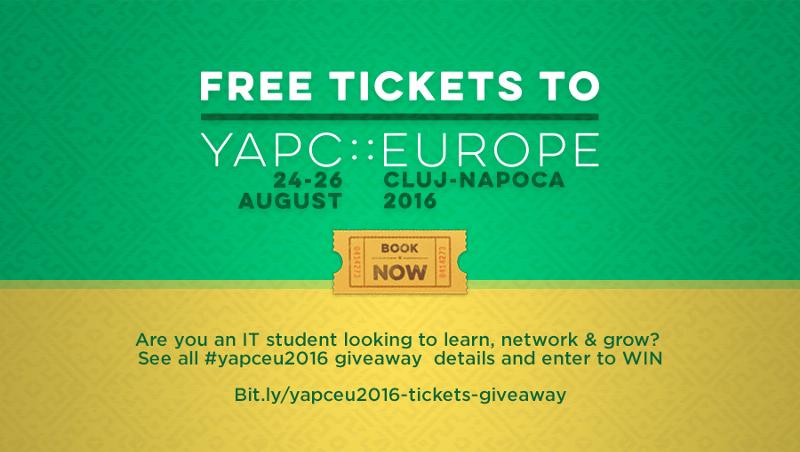 And if you really, really want in tweet at us (@yapceu) or post on Facebook (tagging YAPC::Europe 2016) saying something like “I’d really like to go to #yapceu2016 “ or anything else just so that we know who’s super interested in the ticket.